The splitter crux pitch on Bloodline. Mega Classic! In the quest to find awesome forgotten routes in Red Rocks, sometimes you have to travel off the beaten path. Other times, that classic line is less than half an hour from the parking lot. Bloodline is a classic 4-pitch 5.11a at the top of "the cone"on the northwestern side of Mescalito. The first two pitches ascend the left side of this cone and up to the base of the cavernous chimney that is a route known as Deep Space. The really fun climbing begins on the left side of the chimney, with a long(150 ft.) bolted face climb which both my partner and I thought was fun, engaging, and sustained enough to deserve a 5.10c rating. The rock on this pitch was excellent and varied, providing some unusual and extremely fun movement. Rad! 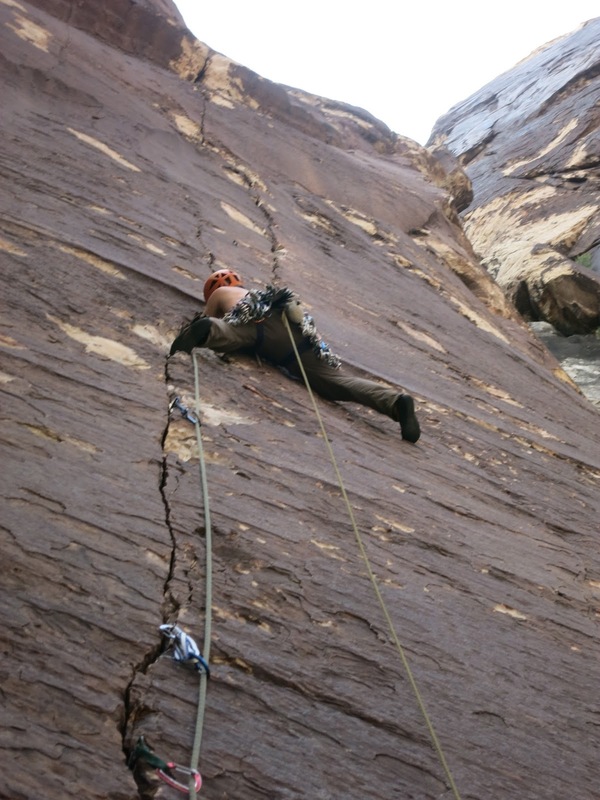 The next and final pitch of Bloodline is the crux finger crack. The crack is very thin- only big enough for me to get the first knuckle of my fingers in. Most of the climbing felt like 5.10, with some difficult moves to good rests. The crux is a short 5.11a section where the feet disappear and the crack is really all you have to work with. A couple hard moves with great gear puts you underneath a hand-crack bulge which guards the anchor. 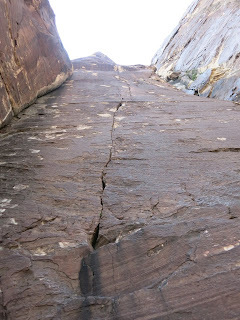 There was a tiny bit of loose rock on this bulge, so be careful with your protection and make sure your belayer is alert, since they are anchored in the potential line of fire. We continued on to try for the summit of Mescalito after this pitch, and after some scary, loose climbing, found ourselves below the Red Chimney, which guards the summit of Mescalito from Cat in the Hat buttress. I definitely would recommend rapping the route from the top of the crux pitch! Bloodline is an amazing climb, and very approachable for the grade. It is in the shade all day so if you are looking for something to climb when it is hot, give this one a try!